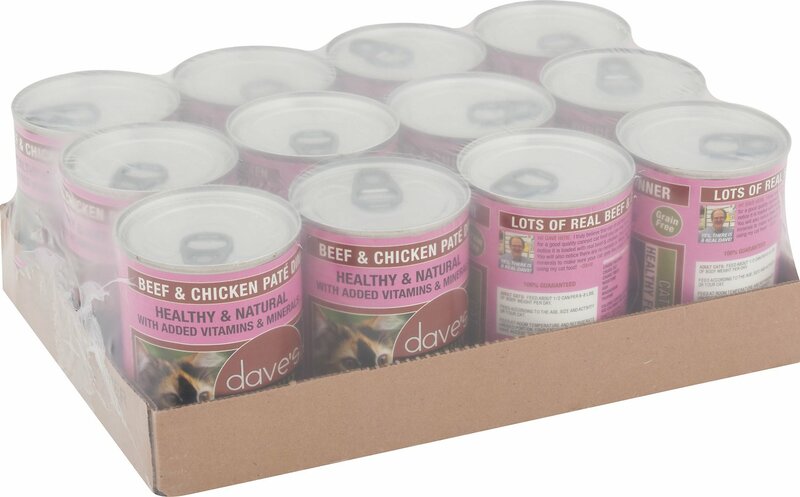 Give your kitty the nutrition he needs to thrive with Dave's Pet Food Naturally Healthy Grain-Free Beef & Chicken Dinner Canned Cat Food. The formula provides plenty of protein to fuel all those adventures, with protein-rich beef and chicken as the top ingredients. Every juicy bite is loaded with wholesome omegas for a lustrous coat, plus vitamins, minerals and essential taurine to help your pal look and feel his best. With no grains, wheat or anything artificial, even kitties with sensitivities can dive into their bowl. Grain-free wet food is made with beef and chicken as the top ingredients for animal sourced protein to support healthy muscles. Contains omega-3 and 6 fatty acids to nourish skin and fur, with zero grains, wheat or wheat gluten so it’s great for kitties with sensitivities or food allergies. Supports digestive and urinary health by providing adequate hydration from tasty broth-based gravy. Provides a complete and balanced diet for all breeds, on its own or as a tasty kibble topper. Water Sufficient for Processing, Beef, Chicken, Beef Liver, Poultry Liver, Egg Product, Guar Gum, Potassium Chloride, Salt, Carrageenan, Vitamins (Vitamin E, A, D3, B12 Supplements, Thiamine Mononitrate (Vitamin B1), Niacin, D-Calcium Pantothenate, Pyridoxine Hydrochloride (Vitamin B6), Riboflavin Supplement (Vitamin B2), Folic Acid, Biotin), Choline Chloride, Minerals (Ferrous Sulfate, Zinc Oxide, Copper Proteinate, Manganese Sulfate, Potassium Iodide, Sodium Selenite), Taurine. Feed about 1 can per 3 - 3 1/2 lbs of body weight per day. Divide into 2 or more feedings per day. Feed at room temperature and refrigerate unused portion, your cat should have access to clean and fresh water. I ordered this because I bought the same thing in a 5 oz can and my cats liked it, but when I ordered it in the larger size can the texture was different. The small can was very moist and velvety, but the large cans were as hard as a rock and the food was really dry. I don't know why there would be a difference. 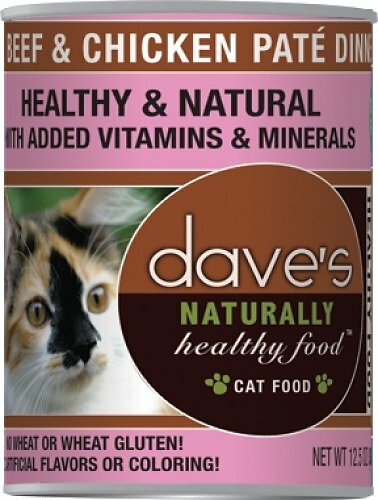 I like Dave's pet food for the quality and affordable price, but this was different from the food I tried before. I am still feeding it to my cats with some water mixed in with it but they don't always finish it. Maybe I'll try a different flavor next time. My cat, Frank, took a little while to like this food. Its not his favorite but it is mine right now and he enjoys it after 2 days of coercing. I like the ingredients. Grain free and some gravy. Economical and one can goes for 2 days usually with a little dry food. So glad he was able to change over from purina. I got the beef and chicken. He really seems to like it now. I researched the nutritional values of a lot of brands. 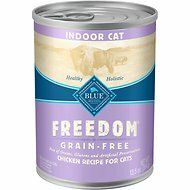 This food has 11% protein and .32% carbs (as fed) which makes it a good choice for a diabetic cat. Plus she likes it and has gained weight. Also it is reasonably priced. This food is one of the three canned foods that I have on rotation. My cat enjoys this food. It is fairly dry in comparison to other pate foods that I give my cat but I just add a little more water to it. Overall it’s great! although my ragdoll boys have preferred dave's gravy packets to all others, they have given this a paws down for the most part. My cat just can’t wait for this food service and he knows what he’s getting. After all he like the consistency of it and the gravy makes it easy for him to eat. He never was a crunchy bite eater. I ordered this and neither of my kitties would touch this flavor, they are huge fans of all the other fish flavors. I gave to a friend who has 4 cats and none of them would touch it. So I went to feed it to a neighborhood colony I take care of And they wouldn't even eat it. They ate the dry food I put down for them instead! So that was enough feed back for me! Try the other fish flavors those are a hit, but not this one. Good quality product at a very reasonable price. Don't we all know a Dave? I figured I'd try his canned cat food for my finicky cats. Wow. They love the 3 different formulas I tried: the turkey, beef & chicken, and the chicken & whitefish. I like that its a soft pate with plenty of gravy. 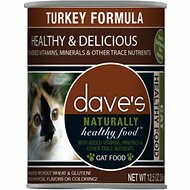 I always want to increase the moisture my cats eat, and this brand is the right consistency. I bought it because it was a mid-range price, high quality, canned food. My finicky cats can't wait for Dave's every morning! Makes me feel like it was made just for us by my brother Dave! Good food , great price , no issues at. All , cats eating it well , they know when it’s opened .